When: Saturday, September 1, 7:30 p.m.
Whistle: Chris Penso (REF), Kathryn Nesbitt (AR1), Cameron Blanchard (AR2), Rubiel Vazquez (4th), Alex Chilowicz (VAR). The Philadelphia Union are really onto something here. Wednesday’s 2-0 win over D.C. United wasn’t entirely decisive, but then again, who cares. That’s five wins in a row. That’s four out of five on the road. Suddenly a trip down to Orlando on Saturday night looks extremely enticing. And it’s not just because Orlando is nestled on the bottom of the Eastern Conference and can’t play defense worth a lick. It’s been a long time since the Union were this hot — maybe they’ve never been this hot. Even on short rest heading into the third match in a week, Jim Curtin has got to be licking his chops over this one. Orlando hasn’t won a match since the middle of July? Let’s get it. It actually gets worse. That 2-1 win over Toronto on July 14 is Orlando’s lone Major League Soccer win since May 6. It’s almost like everything just evaporated after a six-game winning streak early in the season that included a 2-0 edge over the Union. Saturday’s hosts have just four results since that time, one of which was against Miami United in the U.S. Open Cup. If Philly is in possibly the best form in club history, Orlando is in the worst form in club history. Now, that being said, they can score a bit — at least, Dom Dwyer can score a bit. He’s 9th in the league in scoring (17) and Orlando has actually scored one more goal on the season (38) than the Union. It sounds like a recipe for success, but the defense truly has been that bad. Excluding that 3-0 win over Miami United, that above 2-0 win on April 14th is their lone clean sheet of the season. Conceding 59 goals, seven more than any other team in the league, is exactly how to negate a top goalscorer like Dwyer. 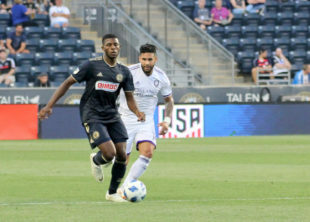 In the U.S. Open Cup semifinal last month, the Union nabbed an early goal from Alejandro Bedoya and sat on a lead for almost 90 minutes. That might be all it takes again this weekend — stop Dwyer, keep climbing the table. Almost all season, supporters have been craving change. Change the lineup or change the formation or change the way things are happening. What about now? Five wins on the trot, some of those same fans may secretly be hoping that not much changes ahead of this match. Cory Burke is one of the hottest forwards in MLS. C.J. Sapong just got back on the score sheet and is seemingly settling into a new role on the right wing. Jack Elliott is back. Andre Blake is a beast. If all’s not well, it’s pretty damn close. Still, it’d be a lot easier to throw the same lineup out there on Saturday if there wasn’t the midweek match. Any lineup changes will most likely be chalked up to rest or preserving energy. You’ve also got to wonder just how much tactics are driving the current win streak. Of course it has something to do with it, but the Union seem to have a collective confidence flowing right now — the kind that isn’t going to be impacted by a player switch here or there. The last thing you want to do against the bottom feeders of the East is take your foot off the gas, but it’s hard to imagine a more favorable match at this point. Sure, Orlando’s at home, but they’ve been anything but dominant there. Whoever Curtin sends out there will have the sole task of keeping this thing rolling. Auston Trusty is also a part of this matchup, but he’s got a a lot more pace than Elliott. Dwyer can scoot by defenders in a hurry and keeping up with him can be half the battle sometimes. Limit his chances and let the boys on the other end grab the goals. Sapong’s goal was a punch-in on Wednesday, but there’s no chance he cares — after last season. he just wants goals. He’s always been a streaky forward and any goal at all could start a streak. He could be heating up on the wing, which would mean bad news for Orlando and others. Burke’s also got to love having him on the right, dragging defenders away and opening pockets in front of the box. The way they work off each other plays a big role in the Union offense. It’s a rare circumstance in which looking back at the matchup earlier in the season does almost no good because these are two totally different teams. One is surging and one is in free fall. If the Union get some decent chances, a goal is bound to come — they always do against Orlando. And one goal could be all it takes. In 25 matches, just two have ended in a draw for the home side. The win streak will end and all the usual questioning will resume, but it doesn’t feel like this is the one. This one feels like six. I loved Sapong’s goal on Wednesday. Great positioning, great passing, great movement, and enough awareness to slow his run, hold his defender on his hip, and do everything it took to get the ball in. Vintage. When did Real get that knee sprain? Not that he would play for the first team anymore this year, just wondering since he was starting in BSFC and I imagine he would get another chance next training camp to become the back up LB. Last Saturday, he was substituted out in the 6th minute of Bethlehem’s game against Nashville. This would be an ideal game to start our A team, try to take advantage of Orlando’s bad D by getting ahead early, then resting some of our older stars. If the situation allows, I would love to see some combination of Bedoya / Haris / Dockal subbed at half or 60 minutes in. Alternatively, I suppose you could start a couple on the bench and only bring them in if needed in the second half – just hate to mess with the chemistry that’s been brewing lately. Maybe Orlando City has bad D, but we have good O, so watch out, Union. If you think you can win this game, you got another think coming. Orlando City may be last in the East, but the only way the Lions can go is UP! Sure, Orlando City has not made the playoffs in their 4 MLS seasons so far, but the Lions will get there in 2019. Watch and see.